Case Study of a Group Class Project. Utilizing automation, design a new concept for fast, fresh food on campus. Design concept of a university dining facility that utilizes automation and delivers fast, fresh food on campus. There is a real food crisis on Western’s campus. The cost of meals and snacks is high while the availability for healthy food is low, couple that with the lack of available space to build a new dining facility and the future of food on campus seems bleak. Utilizing automation, design a new concept for fast, fresh food on campus. 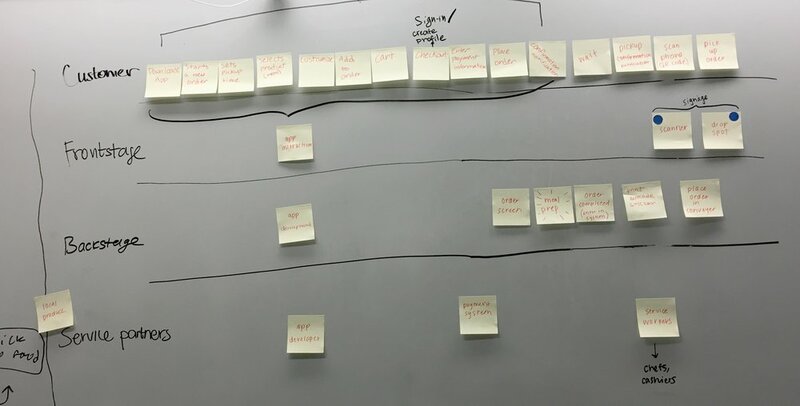 We had three original concepts we wanted to explore for our service design, including a food truck, redesigning the layout of a buffet-styled campus market, and placing a vending machine in high-traffic areas on campus. Aramark has a monopoly over all campus food delivery services, which is why food prices are noticeably higher on college and university campuses. Independent vendors are not required to purchase produce and other food products through Aramark, which in turn means they have control over their own pricing. 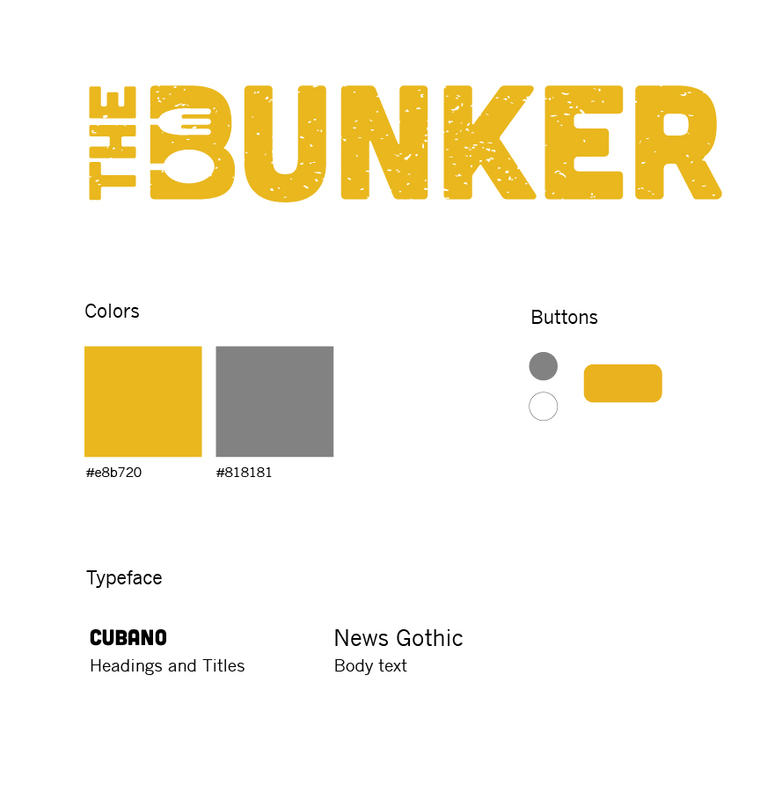 We decided to establish it as an independent vendor in order to provide the cheapest, yet wholesome menu at The Bunker. We researched food services on other college campuses and found a list of universities that were considered to offer the best college dining in the United States. The website that listed these colleges claimed that the best schools had healthy food, were eco-friendly and offered a variety of options for people with dietary restrictions. A lot of these places also used food that was partly provided by local farms. One of them offered a “grab and go” station on campus that provides hot food and a new menu every week. Surveys were useful to get general information about the goals of the users. We conducted additional one-on-one interviews with a few people to get a better understanding of their experience with a grab-and-go service. Users who have had experience with a grab-and-go service consider it a very fast and efficient way to get food when you are very busy. They like it and would use it in the future. Users who haven’t had experience with grab-and-go food think that it would be a beneficial service for places like big office buildings where people are on the go because they don’t have to stress out about how much time they have and whether there are going to be long lines. The users are willing to try the service if they are on a tight schedule. According to a survey, students on the WWU campus said that they were less willing to buy food that is overpriced. Also, a lot of them felt that even though they want to make healthier eating choices, there weren’t a lot of options to choose from. Students are often in a hurry when shopping at a campus market, yet the cashier experience slow the line down. Implementing an app that would eliminate long lines and improve the payment process. The system will be successful if users understand the relationship between the product and the dining location, and are able to navigate through the service to accomplish their goal. Students and faculty lack healthy meal options on campus that are affordable, and they often require wasting time they do not have by waiting in long lines. Bunker is a vendor-styled service that integrates the use of an app, allowing pre-orders, fast pick-up and meal customization. Here we outlined the different stages and the touch points between the customer, the app and the front stage of the service. The customer would order their food through the app and choose a time to pick it up. When they complete their order it is sent to our computers and the order would appear on the service screen for the employees to see. When the customer comes to pick up their order they simply scan their phone on the outside of the Bunker and then a machine will place their food in the pick up window. Visualizing the vendor and automated conveyor technology. Molly’s class lecture is about to be over. She is starving and wants to grab something to eat before she heads out to her next class. The new grab-and-go dining place on campus is nearby. Molly opens the store app on her phone, and starts a new order that she wants to pick up in 20 minutes. Picking from a list of items she built up a chicken sandwich with tomatoes, olives and lettuce over whole grain bread. She selects a payment method, and places her order. She will walk up there after class and have the cashier scan the barcode on her phone in order to pick it up. Andrea is a health nut. But, she is also an extremely busy student with little to no free time. Her favorite place to grab a quick, healthy bite to eat is “The Bunker”. She already has the app downloaded, has her billing and mailing info saved into the system, and simply wants to order a custom sandwich that she can pick up. She places an order, and verifies she will be there to pick her meal up as soon as possible. Right after she hits send, she realizes she forgot to add her side salad. Thankfully, the 5 minute mark hasn’t hit so she is able to go back and add it. Stan is in class and hungry for a salad and only has 30 minutes in between class times to eat. From The Bunker’s app, he chooses the different items he would like on his salad and completes the order. He gets a notification from the app that his order will take longer than usual, and won't be ready for approximately eighteen minutes due to the lunch rush. He decides to confirm the order anyways. He enters his payment information and sends the order to the eatery. When he gets out of class he walks over to the stand and arrives at the scanner right on time and scans the QR code he received from his email from the app. He is handed his food and he has plenty of time to grab a seat and eat his salad before his next class. For competitor research, we looked at other apps that provided some sort of pre-ordering or To-Go service. Domino's’ app provided a pre-order service where, for example, users could customize a pizza, purchase it ahead of time through the app, and pick-up as soon as the order is ready at the requested time. The tracking system is not accurate, it is a rough estimate based on the observation of the timing and workflow of past employees. The flow of the app was confusing to follow. Built-in tracking system to see when pizza is being made, and when it is near complete. Panera Bread also had the same pre-order service, where customers can pick a specific time to pick their meals up right away or later. Users felt there were too many options to choose from on the preliminary menu. Users want the option to customize meals that are pre-made. If they were to use the app again, users wanted their credit card info saved to avoid having to enter their card every time. We need to reduce the menu to two or three broad categories, such as sandwiches, soups and salads. On top of having the Build-Your-Own feature on the main menu, we need to include the option to request special instructions/customization of the pre-made options menu. We need to add a login-account feature in order to save credit card information for future use. Check out the final product interactive prototype on InvisionApp. The employees at The Bunker would receive a lot of incoming orders every day. We designed a system that allows them to easily review new orders arranged in order of Pick-up time and prepare them. They also have access to a product list where they can manage the vendor’s inventory of ingredients. When a product is out of stock, the customers won’t be able to add it to their customized meals. 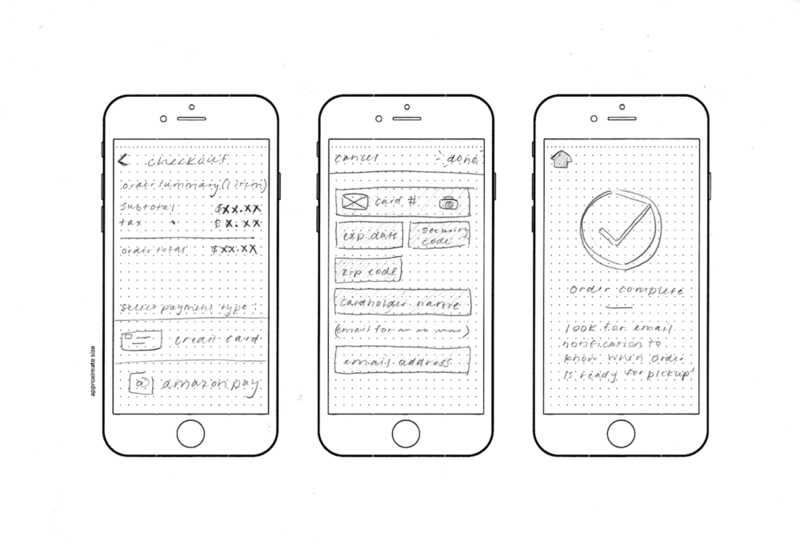 The High-Fidelity Wireframes were tested on users and their interaction and feedback helped to make refinements. The refines product allow for selecting multiple products for preparation. The screen splits and allows multiple employees to work on preparing orders. The employee user interface also features an inventory management portal where products that are out of stock can be marked as unavailable and won't be offered to the customers who customize their sandwiches. We decided to add a side kiosk to the Bunker for users who do not have a phone or want to pay with cash. Users could walk up to the Bunker and use the kiosk to make a customized order rather than ordering a pre-made item. Once you make your order and pay the kiosk will print you a receipt with the QR code required for picking up your food. A short video that our team created to better explain our service design solution that offers healthy, speedy, and affordable food on Western Washington University's campus. Overall we received positive responses on each interface (app, kiosk and order screen). One part of the service design that puzzled most observers was the use of the conveyer belt that takes place behind the scenes. We made sure to clearly summarize this aspect as much as possible in our video in order to avoid confusion. Observers also wondered what would happen if The Bunker had an overload of orders, and how we would combat ensuring orders would still make their delivery on time. 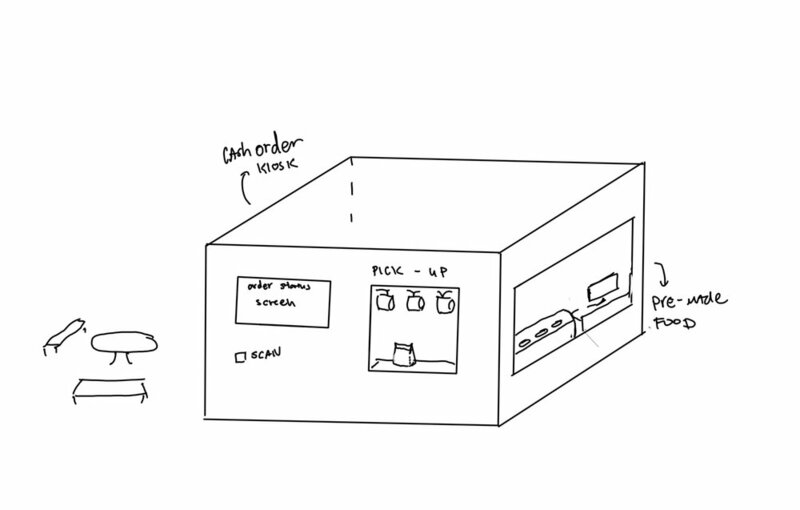 If we were to expand our service design further, users suggested we intermix order deliveries to anywhere on campus.